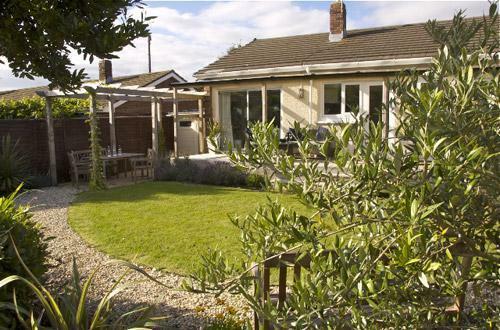 This stylish and comfortable semi-detached bungalow, which benefits from a large covered furnished verandah, is in a very quiet location on the edge of Mumbles Head, within a few minutes walk of panoramic sea views over Swansea Bay. An excellent base for walking to Bracelet Bay or Mumbles restaurants, shops and sea front. Private off road parking, garage, wifi and garden. 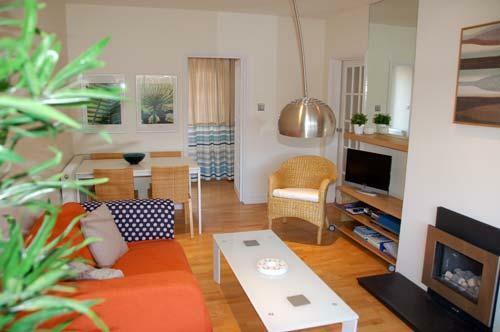 Thistleboon is an ideal base for a coastal holiday for couples, walkers, cyclists and families. With very few steps it is particularly suited to very young children and those with limited mobility. The region enjoys a mild, maritime climate and a plentiful and varied supply of places to visit and things to do whatever the season. 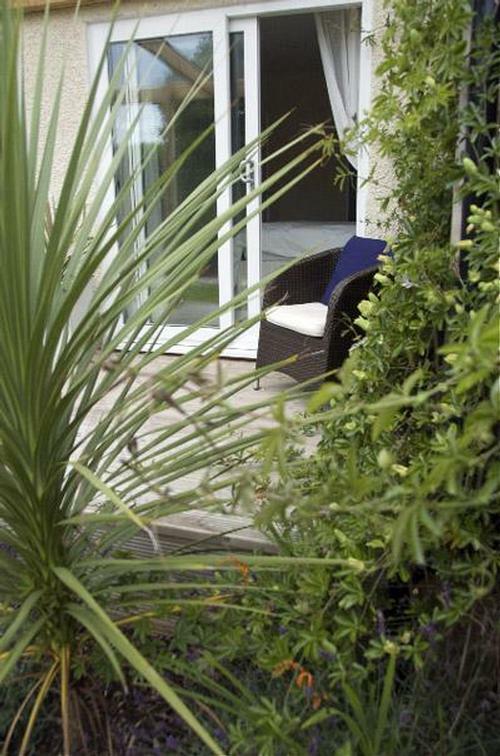 The house is well equipped, centrally heated and double glazed throughout. 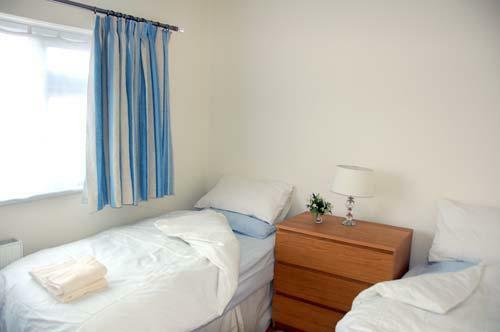 Bed linen and bath towels are supplied and a welcome tray, dvds, games and books await your arrival. The small garage is perfect for storing motorbikes, bicycles and beach paraphernalia and there is private parking on the driveway at the front of the house. The open plan living/dining space features oak flooring, a modern pebble fireplace and slate hearth. The sitting area has two comfortable sofas and a flat screen tv with Freeview and dvd player. Wifi is also included. 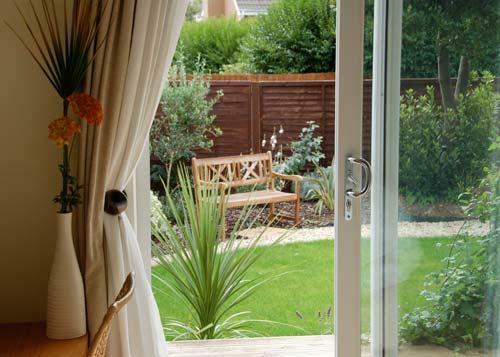 The patio doors lead onto the furnished verandah and garden. The dining area seats four within easy reach of the kitchen. Cushions, throws, lamps and occasional furniture make this an inviting retreat. 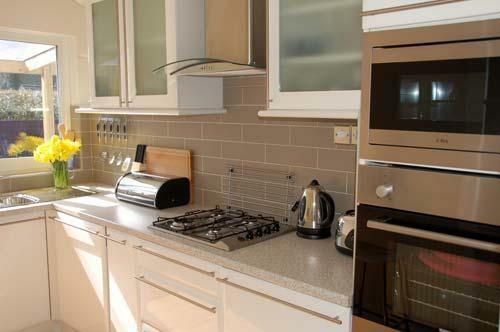 The modern kitchen is very well equipped with integrated appliances including dishwasher, eye level oven/grill and microwave. 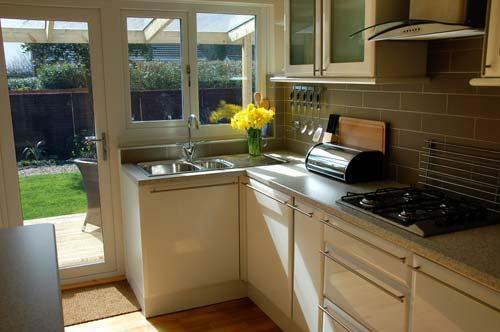 Perch on a stool and enjoy the view over the garden from the breakfast bar. Washing machine too. 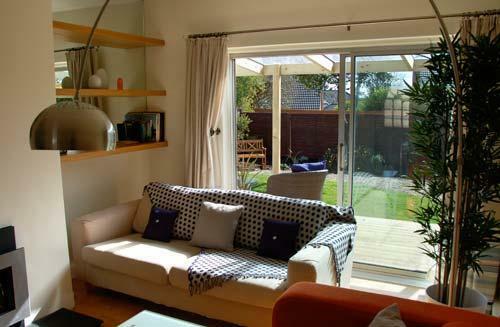 An attractive master bedroom with patio doors opening onto the verandah and garden. King size bed with quality pocket mattress, dressed with quality linen and plenty of wardrobe space. 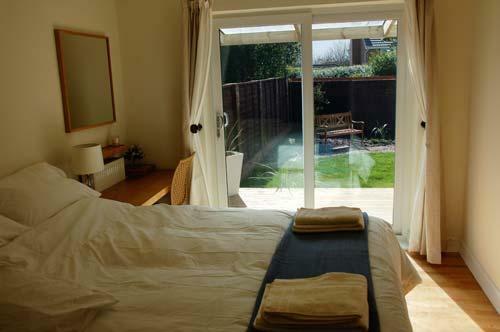 The comfortably furnished twin bedroom has two 3' divan beds plus wardrobe and chest of drawers. White and chrome bathroom suite with double ended bath and shower over and heated chrome towel rail. Bath towels are supplied. The gravel garden is at the front of the property alongside the drive and garage. The secluded south facing flat and enclosed rear garden is a real sun trap, with the verandah leading onto the lawn and flowerbeds. There is an outdoor sofa, chairs and coffee table on the verandah plus mains lighting, as well as a large garden table and chairs on the paved area under the wooden pergola. Thistleboon is on the edge of Mumbles Head, a designated Area of Outstanding Natural Beauty. National Footpaths scheme access point just 3 minutes walk from house. Beautiful cliff top walks along made or unmade paths. Bus stop 3 minutes away and pleasant stroll into village and shops or down to Bracelet Bay and the lighthouse. Enjoy the local beaches, which include Caswell and Langland Bays, or head off to explore Three Cliffs, Oxwich and Rhossilli and other Gower highlights. "Excellent bungalow, good food, beautiful beaches and cliff walks. What more could you ask?" Mr and Mrs B. 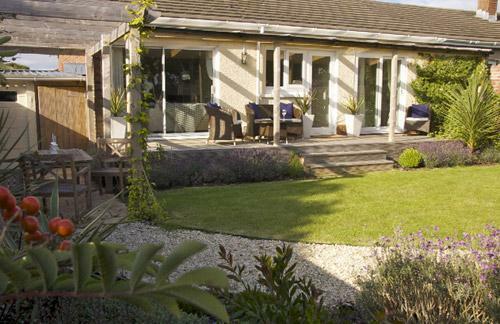 "Bungalow was fab, everything we needed and very comfortable". 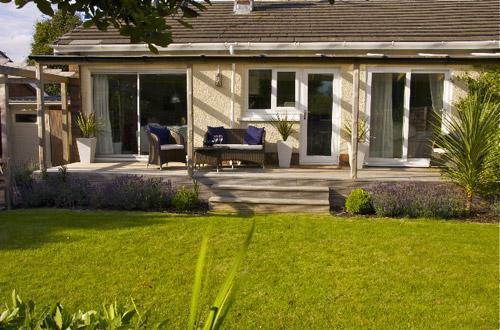 Mr and Mrs R.
"Fantastic bungalow and location, great things to do. Overall a lovely K. Family". "Lovely bungalow, every comfort. Super beaches and Mr and Mrs D.
"Lovely bungalow. Facilities very good including the verandah and N. Family". Payment information: Tariff includes electricity, gas, wifi, bed linen and bathroom towels. A highchair and travel cot is also available if required. Short breaks (minimum 3 nights) available between October and May except for Easter. Pet supplement payable per pet.